Parenthood: a season of routines that constantly change. Did you just get used to the newborn stage? Now it’s over. Did you just get through one set of teething teeth? Rest up; the next cranky, sleepless teething stage is coming soon. And just when you have your bedtime routine set for your 6-month-old, now you have to add a dental routine to the mix?? The American Dental Association recommends you begin a brushing routine as soon as a baby’s first tooth (or set of teeth) has erupted. Prevent tooth decay. Once those cute little teeth have arrived, they can begin to decay as they interact with bacteria naturally present in baby’s mouth. And even though they will fall out eventually, it’s very important to care well for baby teeth. Get baby used to brushing. The earlier you start, the more your baby gets used to the whole brushing (and flossing) routine. Making it a familiar part of their day means less protesting as they get older and more independent (trust us on this). What should baby’s dental routine include? Gently brush any teeth present with a baby tooth brush and a grain-size amount of fluoride toothpaste. A useful technique for getting the right amount of toothpaste is gently dipping the tip of the brush in the toothpaste tube. Make sure that baby has her own designated tube of toothpaste; it’s best not to contaminate baby’s mouth with anyone else’s mouth bacteria as this can hasten tooth decay. After brushing teeth, rinse the toothbrush in water before gently brushing baby’s gums. This helps baby get used to the brushing sensation and also helps ease the pain as more teeth begin poking through. For babies, brushing just once before bedtime should be sufficient; for toddlers, start brushing twice a day – in the morning after breakfast and at bedtime. 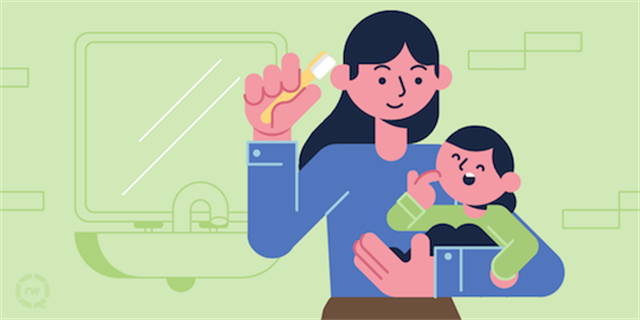 As baby gets older, they can begin taking more responsibility handling the tooth brush themselves, though they will still need help from mom or dad to brush well enough. If at any point they need encouragement, we’ve got some useful ideas to make their dental routine a pleasant experience. As soon as you’ve got two teeth next to each other, you can introduce flossing. Disposable flossers are a great tool for little hands before they are dexterous enough for regular flossing. Just as hand-washing can become an automatic procedure following use of the potty, introducing baby’s dental routine early on will make the whole thing second-nature. The more familiar your child becomes with a good dental routine, the more likely they’ll continue with these healthy habits for life. That’s the hope, at least!